Note: Thank you to those who have told me that this series is helpful! It’s gratifying to be able to share some relatively specialized knowledge with folks. I’m also immensely humbled that a few experts are reading along. I’m particularly grateful to Yaroslav Gorbachov, for his continued dialogue with me and his contributions to this article, particularly on the hesychasm movement and the theology of the Third Rome. Before we move forward, I’m going to backtrack a little. A significant social movement started in the late 1300’s, which we now call the second south Slavic influence. When Serbia and Bulgaria fell to the Ottomans, their monks and priests fled north, finding a home in Rus’. We find their influence not only in the orthography of the day, but also in the intellectual and cultural movement of the church. In terms of the Orthodox church, it’s important to note that Rus’ had been thought off as a relatively remote outpost of Christendom up until this point, with few scholars and little centralized church structure. When these immigrants arrived, that found a church that, in their estimation, had lost the purity of their doctrine and scripture, which they thought had been corrupted over the centuries by contact with pagan East Slavs. They set about putting things to rights, and igniting a spiritual awakening that took the form of a deeper pursuit of holiness and asceticism. 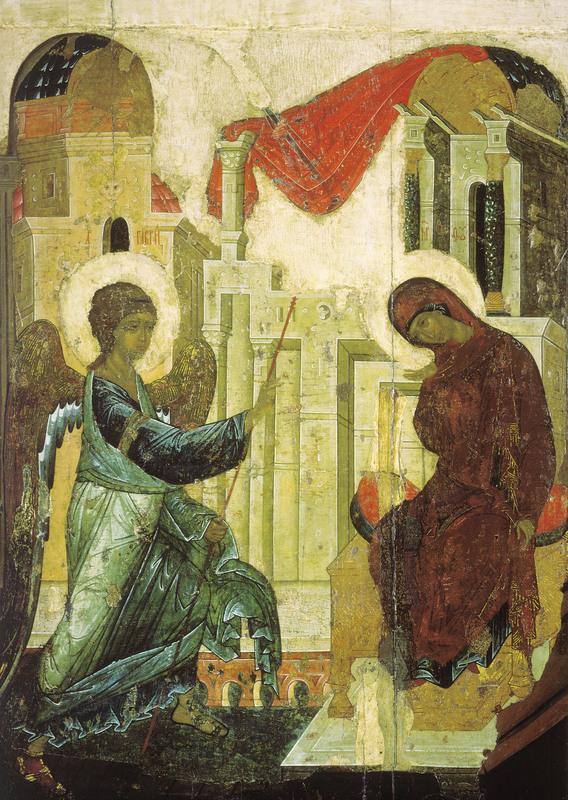 Hesychasm (from Greek hesychia, “stillness, silence”, a tradition of silent and “imageless” prayer in Eastern Orthodoxy) became popular at the time and remains influential in monastic practice and Orthodox thought of today. 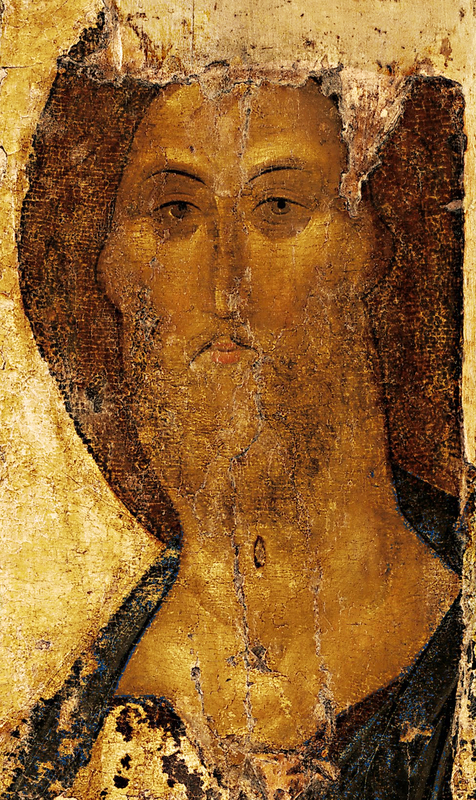 Evidence of this “purifying” effort is seen in the rise of monasteries (most famously, the Trinity-St. Sergius Lavra founded by the most influential hesychast of his time, St. Sergius of Radonezh) and a new school of icon painting (St. Andrei Rublev, another famous hesychast, who I mentioned in my last post, was part of this movement, too). Literary and linguistic forms were also radically transformed. In the writing of the time, we see another influx of south Slavic orthographic conventions and many new loan translations from Greek. South Slavic influences also affected the traditions of manuscript ornamentation. Literary styles show Balkan influences as well. Hagiographies (the stories of saints’ lives) and homilies (edifying sermons following a reading of scripture) adopt a style called “word weaving” or “the braiding of words”, a kind of “verbal ornamentation” technique whereby words with the same root, similar sounding words, synonyms, similes, and so on, are repeated as if they were elements in an ornamental pattern, creating a mesmerizing and mind-silencing rhythm. Some writers of the sixteenth and seventeenth centuries, in particular Maximus the Greek used the verbs “to compose” and “to braid” verse as synonyms when describing their writing. The second south Slavic influence is contemporary with the renaissance in Italy, and raises a key cultural observation – as Western Europe was exploring new cultural frontiers by overthrowing existing social and artistic norms (what could be broadly thought of as a liberalization of intellectual and artistic thought), Russia was experiencing cultural re-birth by undergoing a process of purification, removing unwanted elements from their cultural imagination, opting for older, more austere and conservative forms of Christian worship. If the Renaissance was a great liberalizing movement, its contemporary movement in Russia could be seen as a conservative mirror. It’s important to note here that this movement also produced stunning works of art and literature, and was far from anti-intellectual. It would be incorrect to characterize the movement as “backwards” or non-progressive. It does, however, underscore Russia’s deeply conservative spirit. It was at this time of religious revival that a first attempt at freeing Russia from the Mongols was undertaken. 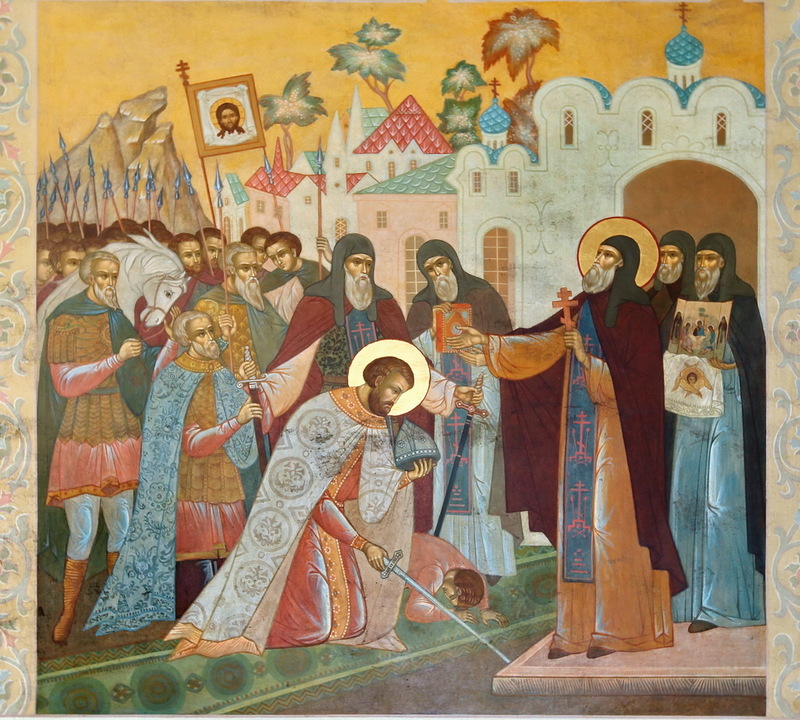 Sergius of Radonezh blessed the prince of Moscow and the Grand Prince of Vladimir, Dmitry Donskoi, to challenge Mongol authority openly in the battle of Kulikovo (1380), the first military victory that the Russians ever had over the Mongols since the Mongol invasion of 1237-1240. 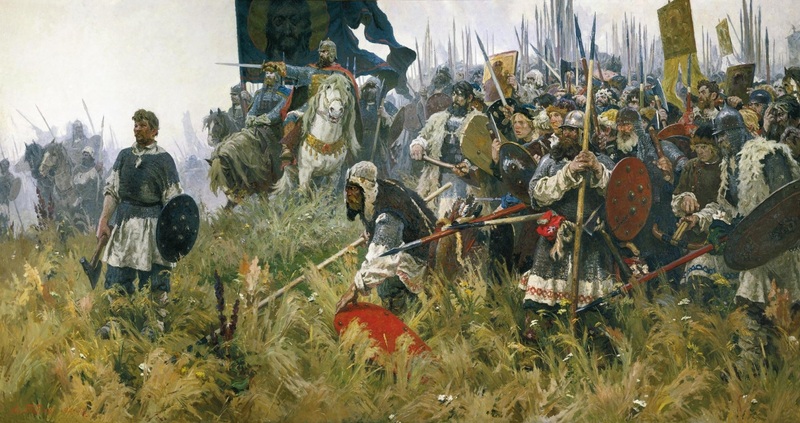 The victory at Kulikovo, on the Don River, gave prince Dmitry his nickname Donskoi (“of the Don”). I mentioned this briefly last week, as well, but it’s important to note its religious and cultural context. In the 1400’s, politics continued to shift. Kiev had fallen from prominence as a principality a long time ago, and North-Eastern Rus’, first Vladimir, and then Moscow, had been growing as a political and economic powerhouse. This was not in small part because Moscow’s rulers were clever enough to make sure they always were on good terms with their Mongol overlords (with Dmitri Donskoi the single exception). With the ascension of Ivan III in 1462, things changed. Ivan set about consolidating land and power from rival princes and sought to free Muscovite Rus’ from the Mongol rule, as the Mongols grew progressively weaker. The “Mongol yoke” finally came to an end in 1480, due to internal power struggles in the Golden Horde and the increasing unwillingness of the Russians to keep the status quo. 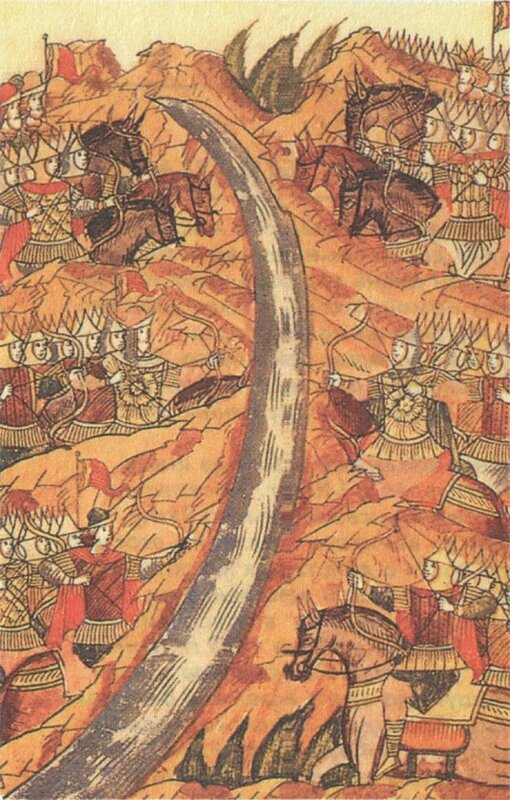 The end of Mongol rule was signaled by a four-day battle and a subsequent faceoff between the two armies on the Ugra River, when neither the Mongols nor the Russians dared to attack for over a month and the Mongols ended up withdrawing. It was Ivan who stopped paying the tribute that the Mongols demanded (1480) after adding the Novgorod Republic to his possessions (1478), thus doubling, if not tripling, the territory under his control. Moscow Rus’ thus became a powerful Czardom, and Ivan III assumed the title ‘Czar’ (the Russian rendition of Latin Caesar), tantamount to today’s ‘Emperor’. Simultaneously, the fall of Constantinople to the Ottoman Turks in 1453 had created a power vacuum in the realm of the Orthodox Church, which had parted ways with Rome in 1053. When Constantine the Great moved the capital of the Roman Empire to the city of Byzantium (Constantinople), he dubbed it “New Rome” (Nea Rhome) or “Second Rome” (Deutera Rhome) by official decree. When Constantinople fell to the Turks, Orthodox kings around South-Eastern Europe (including Bulgaria) began vying to claim the title of the Third Rome, and head of Pax Orthodoxa. After the Orthodox kingdoms of the Balkans were, like the Byzantine Empire, conquered by the Turks, Muscovite Russia found itself in the curious and precarious position as the only Orthodox Kingdom in the world. In the eyes of medieval Orthodox clergymen and monks, Orthodoxy was the only true form of Christianity (since Catholicism was fallen and corrupt, and thus incapable of bringing salvation). If the last Russia, the last Orthodox kingdom were to fall, Orthodoxy would cease to exist, and salvation would not be available to man. Human history would have run its course, and its continuation would have been pointless.The fall of Russia as the last bastion of Orthodoxy would quite literally signal the end of the world: the Coming of Antichrist and the Last Judgment. It was in this historical and ideological context that the Russian monk Filofei (Philotheus) and some of his contemporaries wrote their letters and treatises in the first half of 16th century, outlining the role of Russia as the sole restraining power keeping in check de-Christianization of the world and thus postponing the coming of Antichrist. Those authors operated with the notion of “translatio imperii” (transfer of the imperial status from Rome to Constantinople to Moscow). The theory of translatio imperii had originated in Jewish eschatology, with Daniel’s visions of four subsequent empires in Daniel, Chapter 2. As Filofei wrote, “Two Romes have fallen, the third one (Moscow) is still standing…” Read Filofei’s letter to the Czar. In sum, Moscow as the Third Rome was not a political notion (presupposing an imperialist agenda), but one based in a philosophy of history and theological understanding of the end times. Its main concern was to ensure longevity of Russia and thus delay the coming of Antichrist. Russia’s longevity could only be ensured if her Orthodox Czar was a just, man-loving, and God-fearing ruler creating in his realm all necessary condition for a pious life of his subjects. This is the point made by Filofei and his contemporaries, while they decried the low state of morals in the realm of the Moscow Czar. It is not clear whether the ideology of Moscow as the Third Rome had already been fully developed in the time of Ivan III. All we know is that he probably did consider himself the true and only successor of the Byzantine emperors, as he married Sophia (Zoe) Paleologue, the niece of the last Byzantine emperor (1472), adopted the Byzantine imperial double-headed eagle as Russia’s official coat of arms (1497), and styled himself ‘Czar’ in his foreign correspondence. It was his grandson, Ivan IV (more commonly known as Ivan the Terrible) who was officially crowned the first Czar, at age 16 in 1547, and it was Ivan IV who truly extended the Russian lands to imperial proportions. His title was now the same as the former Byzantine emperor and Tatar Khan, sending a message about his sovereignty. As a side note, it’s important to recognize that “grozny,” which we commonly translate as “terrible” does not have the same connotations in Russian, and Ivan IV’s nickname was intended to communicate his power and strictness, not that he was a horrible person. 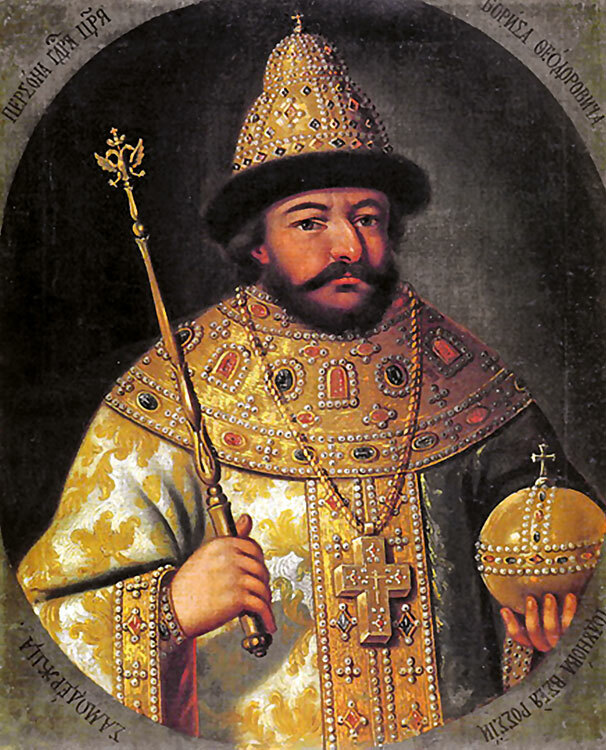 Ivan’s reign brought massive changes to the Russian state, not just because he extended its power over the Khanate of Kazan (on the Volga) and Siberia and, but because he ruthlessly worked to centralize power through a set of policies he called “oprichnina.” While Ivan’s motivations for instituting oprichnina are debated, the result was devastating to the boyars (landed aristocracy). Ivan’s policies not only allowed him to systematically imprison and execute rival princes, but also confiscate lands in certain areas and place them under the direct rule of the Czar and his chosen officials. Oprichnina ended in 1572, but the Czar’s ability to exert his power would not soon be forgotten. Fun fact, he also had eight wives, a la his contemporary, Henry VIII of England (who, to be fair, only had six). 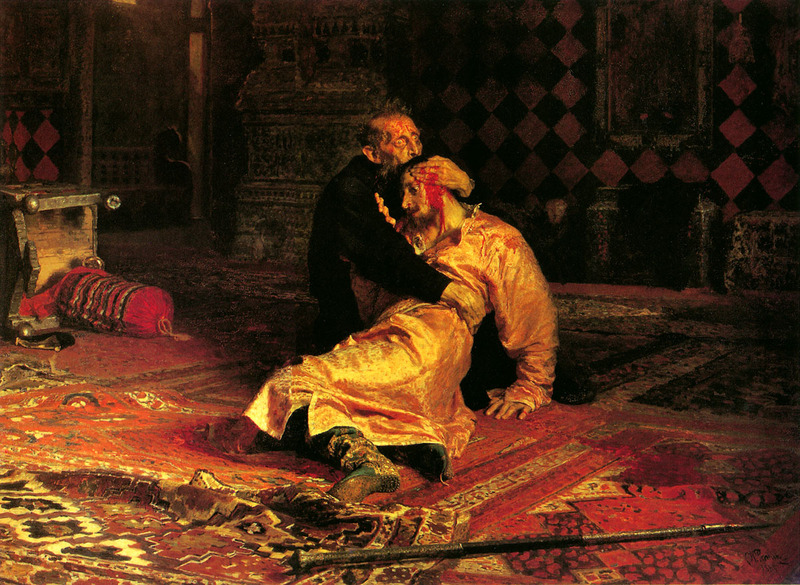 Ivan IV died in 1584, and left behind a feeble son, Feodor. His regent was the famous Boris Godunov (immortalized by Pushkin and Mussorgsky), who seized the throne upon his death. Boris Godunov’s short reign saw Russia descend into the Time of Troubles, a decade of famine, civil wars, and Polish occupation of the country, all sparked by the dynastic crisis left by Feodor’s death. Notable was the rise of the false Dmitris, pretenders to the throne who claimed to be Ivan IV’s youngest son. The real Dmitri had been assassinated at age 8, but that didn’t stop three different men from claiming his identity and vying for the throne. One even reigned for a whole year, supported by Polish nobility. The “false Dmitris” are commonly referenced in literature and culture to this day. After ten years of turmoil and wars with the Poles, the Russian aristocracy unified around a new dynasty – the Romanovs. Their connection to the throne was established, as Ivan IV’s first wife (and mother of Feodor I) was a Romanov, and the first Czarina. Mikhail I was unanimously elected Czar, and established the line that continued to reign (more or less) until the fall of the Russian Empire in 1917. ← Understanding Russia: Master Post!